This is one I swiped shamelessly from Mike Guadango at Freak Strength. Controlled descent with weight on one leg, standing up with both legs. So you get a relatively heavily loaded eccentric (sitting down) portion of the exercise, with a safe landing if there is any issue with the rep, followed by a light two-legged standup. This worked wonders for own my knee issue, and conversations with Mike about why led me to bring it over from the athletic training environment to the more general health-and-healthy-movement training that I do. You can generally perform an eccentric movement - lowering a weight - with a heavier load than you can perform a concentric movement. Therefore you can use a little heavier load with this than someone could easily use for standing up on one leg, allowing for a better strength improvement. 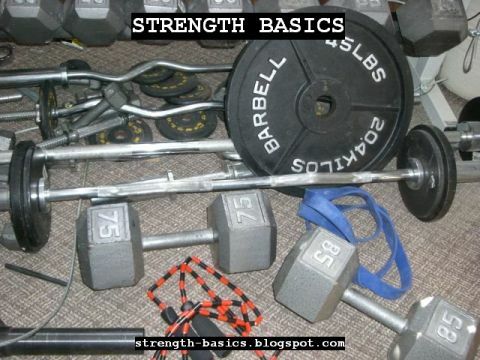 You also tend to get strength in a slightly large range of motion than the one you use. So I can put a box-and-pads at a height just at the level that someone can perform the exercise and get them stronger there and at a lower height as well. If necessary, I can slowly work up and then remove a pad (or put a smaller one on) and work them up there, until we reach the desired height. That's not a complete explanation of the whys and hows of the exercise, but it's one of the main reasons I find this exercise so useful for knee issues. I've also found it's useful for clients with large side-to-side leg strength differences. Nothing irons it out like slowly lowering to a box under a load.